A few years ago Hasson & Wong started to document patient results with video to supplement our photo gallery. Initially the videos were shot using a standard definition video camera and while the depth of field is an improvement the detail was lacking compared to clearly focused photographs. Two years ago we started to experiment with high definition video to address this lack of detail. After much in-house work we figured out how to convert the video to a manageable size that could be streamed through the internet over broadband. Since then we have built a library of videos that far surpasses any other clinic in the industry. This library has 86 videos as of this writing, of which 61 are high definition patient results videos and 25 are informational videos. High definition, when utilized for documenting results, offers not only the improved depth of field that photos lack but it also allows for details not seen in traditional standard definition video such as detailed close-ups of transplanted hairs at the exit point in the recipient scalp. Only high definition video can show these details with any sort of respectable clarity or focus. The use of standard definition video is in our opinion not nearly as effective and in many cases is simply useless. We encourage all clinics to begin using high definition video to document results for the benefit of all. There simply is no better way to document your results for patient education. That is it. Our current camera is not even made any more and one can purchase an equivalent or better camera for 600.00 so for a grand total of 739.00 (give or take) any clinic can start documenting in high definition and at the very least upload to Youtube. This is a miniscule investment for any clinic. Adobe Premiere Elements is pretty easy to figure out as well. If clinic needs details on bitrates, file sizes etc. then I’m happy to share our specifications. The following is a compilation of videos we have uploaded every Friday since March 20th, 2009. Our goal is to upload at least one video per week and so far we’ve met this goal. Results are posted as most recent upload shown first. This local patient asked Dr. Hasson to restore a more youthful appearance for him as he felt that he looked much older than he really was. 4580 grafts were moved 3.5 years ago for the result you see below. This local NW6 patient originally came to see Dr. Wong in July of 2005 and received 4953 grafts in one session. He returned in August of 2006 for a second session of 2265 grafts. We presented his case in photos and video two years ago and I have included one of his older photos from that time frame to compare. It is the second photo in the collage. This repair patient came to Dr. Hasson 3 years ago with the hope that his previous transplant results could be camouflaged and improved. 7818 grafts were transplanted in one session for the result seen below. This local patient came in to see Dr. Wong about filling in the thinning areas on his scalp and to rebuild his hairline. One session of 5409 grafts was performed 16 months ago and the result is shown below. This patient came to see Dr. Wong in May of 2008. He had a hairline that was naturally already thick and not receding so no work was done in that area however his crown had thinned considerably and made the patient very self conscious. Dr. Wong and his team rebuilt the patient’s natural whorl pattern using the lateral slit technique so the angle and direction could be oriented with maximum control. 2562 grafts were used to achieve the result shown. This is a unique case that no doubt most of you have not seen the likes of before. This local patient underwent a procedure many years ago to attach a hair system to his scalp. At one point some clinics would create “tunnels” in a patient’s scalp tissue in order for hooks from a system to latch onto. We have seen several of these cases over the years and have reversed them all successfully. Dr. Hasson performed two procedures on this patient. The first session was performed to remove the tunnels and give the scalp time to heal. Once done Dr. Hasson and his team were able to move 4134 grafts in one session. Ten months later (and without hair coloring) the patient has a much more manageable head of hair that is not subject to routine maintenance (and infection) like his old hair system. This local patient suffered from what is known as traction alopecia. In his case it was caused by wearing the traditional “Patka” turban common among Sikh youth and is a condition we see in our office often because of the large Sikh community in Vancouver. His hairline was effectively pulled out over a period of time due to how tight the Patka is worn. Dr. Wong and his team moved 1680 grafts in one session to rebuild a mature but strong hairline that frames his face better and to restore a more youthful appearance. The result shown is ten months after surgery. This patient from the east coast of the United States asked Dr. Hasson to restore as much hair as possible. 8882 Grafts in two sessions allowed for the results you see below. This local patient came in ten months ago for as much of a transformation as surgically possible in one session. Dr. Wong and team moved 5257 grafts in one sitting for the result you see below. This patient had two previous “1000 graft each” surgeries in the UK that left him with with these unsatisfactory results depicted in the before photos. Dr. Hasson placed the majority of the 4371 grafts in the frontal zone both to provide naturalness and hide the old work. Some grafts were placed mid scalp and into the crown for overall balance. This patient will be back for scar revision to reduce the scar from his UK procedures and to add density in the mid scalp and crown. For this patient Dr. Hasson was able to achieve quite a transformation. A rebuild hairline and frontal zone with coverage back to the crown has given him the appear of a full head of hair. This video is nine months post-op. This patient had two procedures with Dr. Wong, the first of which was in early 2002. The second procedure was performed in 2003 for a total of 2932 grafts. The final result shown is six years post-op. The hairline and crown were the focus of each procedure. This local to Vancouver patient wanted to have an improved appearance for his wedding. Two procedures were performed with the second being ten months ago. The hairline was rebuilt in a conservative fashion but with healthy density. Proper temple recession was established so that the result would be consistent with that of an adult male. His cousins now call him the “Persian Elvis”. This local patient came to see Dr. Hasson two years ago. He requested hairline reconstruction for a younger appearance and for the option for more hair styles. 3355 grafts were used to accomplish his goals. This patient had two previous mini-graft procedures in the early nineties. Because he was not informed at the time about Rogaine or Propecia he continued to lose hair for nine years until he was a NW6+ with two donor scars and very obvious and pluggy looking grafts making up his sparse hairline. Three sessions over the course of 2.5 years were performed for a total of 7917 grafts. Results shown are five years post-op. This local patient came to see Dr. Hasson to fill in his crown area with a new and natural appearing whorl pattern. He was also seeking a new hairline with high density. A second session was performed to lower his hairline further one year later. This local patient came to see Dr. Wong for overall thickening of the top of his scalp as well as hairline reconstruction. Two sessions were performed for a total of 6648 grafts. This local patient came to Dr. Hasson with the stated intention of looking younger. 3337 grafts of his fine hair were transplanted in one session to rebuild an age appropriate hairline and to give him coverage on the top of his scalp. The results shown are one year post-op. This local to Vancouver patient came to Dr. Wong seeking as much of a transformation as possible in one session. With 5020 grafts in one session Dr. Wong and his team created a new hairline, filled in the top of the scalp for greater coverage with a slight dusting to the crown. Eleven months ago this local patient came into our clinic for hair restoration. He wanted the hairline to be reconstructed with good coverage for the mid-scalp. 3448 grafts were placed to achieve his goals. This patient came to see Dr. Wong for a new hairline. Her natural hairline had receded yet she had no other signs of typical female hairloss (diffused loss throughout). Dr. Wong dense packed 2536 grafts in one session to lower her hairline approximately 1.5cm and to fill in the temporal recession to be more appropriate for a female. This local to Vancouver patient came to our clinic 14 months ago for reconstruction of the front 1/2 of his scalp where the loss was obvious. Dr. Hasson used 3422 grafts in one session to rebuild the front half and blend into his existing hair for a smooth transition. This local to Vancouver patient came in last week to show us his results and to express his thanks for a job well done by Dr. Wong and his team. One year ago the patient came in for crown restoration with 2319 grafts in one session. This local patient wished for a new hairline and healthy coverage. 4742 grafts were transplanted ten months ago and the patient was nice enough to come by for a follow up visit to show us his results. This patient approached Dr. Wong with the goal of achieving as much coverage as possible in one session. His donor area characteristics presented an opportunity to perform a larger than average session where 5698 grafts were taken in one session. The priority areas were the hairline and the top with any grafts left over going into the crown. The results shown are only eight months post-op. This patient came to see Dr. Hasson to address his obvious areas of hair loss. In one procedure Dr. Hasson and his team moved 4171 grafts to establish a completely new hairline and solid coverage over most of the top of his scalp. The crown was not addressed as Proscar has been holding it well. The patient is available to meeting if his schedule permits. This patient came from central Canada and asked Dr. Wong to give him as much of a restoration as possible in one session. He was 26 years old and felt that his hair loss made him look considerably older than he was. Dr. Wong rebuilt a hairline that included proper recession for an adult male and gave him a much younger appearance without front-loading the scalp. The patient is 16 months post-op. This local patient wanted to have his hairline and crown area restored so he would look more like his actual age. He understood that his juvenile hairline would not be natural for the long term so an adult hairline with proper temple recession was constructed. Dr. Hasson also reconstructed the natural whorl pattern of his crown for the result you see below. This was accomplished with 3113 grafts in one session. This local patient felt that his existing hairline aged him prematurely. In early 2009 Dr. Hasson used 3009 grafts to rebuild a strong hairline but with proper temple recession to insure his results were appropriate for his age. 7 Months and 3 weeks later the patient returned to show us the result that you see below. They all look very good are they all fue or strip or combination of both? » They all look very good are they all fue or strip or combination of both? Fred, thank you for your question. All of the results I post are strip. We do not perform FUE. Others think it is fine, which is their choice, and we respect that but we think that graft for graft strip will offer a higher chance for successful growth. » 2003. He then had a second session in 2004. Wow that guy is as bald as anyone can get, outstanding work. This patient originally had tunnel grafts to secure his old hair system. He came to Dr. Hasson for removal of these tunnel grafts then, once healed, he returned for 4134 grafts in one session. For those of you that do not know what tunnels are they were a horrific approach to securing a hair system. The idea was that a “hook” on either side and in the back of the hair system would physically latch onto these hooks made out of the patients own skin on his scalp. Dr. Hasson removed the front tunnels via brow lift. Once healed he returned to have a proper hair transplant for the result you see in the HD video at the bottom of this post. His hair is a bit wet to show more detail. 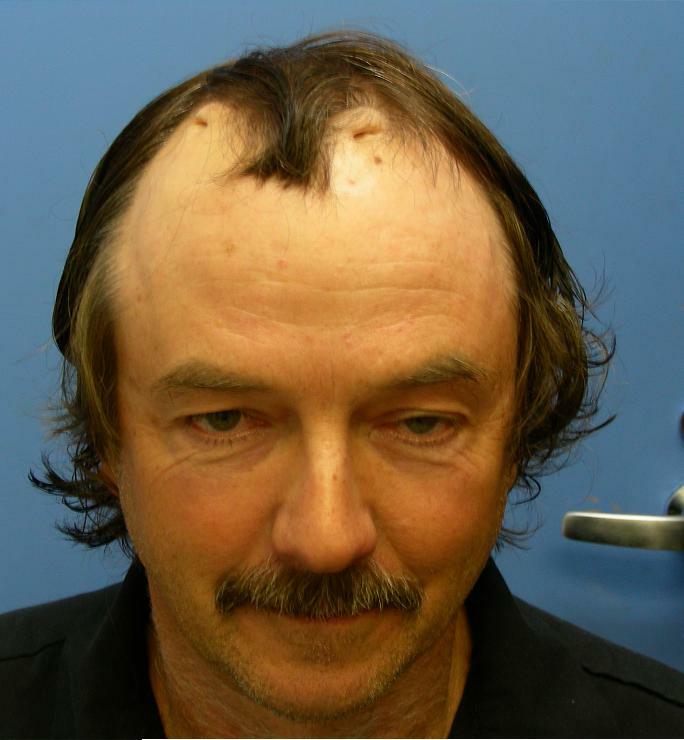 » This patient originally had tunnel grafts to secure his old hair system. » he returned for 4134 grafts in one session. It must hurt like hell, why would anyone want to do that? This local patient came in for mild hairline reshaping and density. In one session Dr. Wong and his team transplanted 1489 grafts to accomplish the agreed upon goals. The results are two years post-op. This patient posts as “Hairshare”. He came to Dr. Wong from New York 10.5 months ago to have a true megasession to address his advanced loss. 5833 grafts were transplanted in one session for the result you see below. Note some of the video shows the hair styled with hair putty to show the versatility of the result. This local patient came to Dr. Hasson to have his frontal scalp restored as well as his crown. 3339 grafts were placed to rebuild his hairline, the areas immediately behind, and for light coverage in the crown. This patient previously had artificial hair fibers transplanted into the frontal half of his scalp with the hopes of having a restored appearance for his hair loss. As is common the result was an unnatural appearance and massive scarring. In the before photos you can see the amount of scarring appears as a “helmet” in the exposed recipient area. The patient traveled from Italy to have two repair sessions with Dr. Wong for the results you see below. This local patient recently came in to show us his results. One year ago Dr. Wong and his team moved 3446 grafts in one session to address the hairline and the top of his scalp. Results are shown below in HD video. This local patient came to Dr. Wong for improvements to his temples and his hairline overall. 2313 grafts were used in one session to improve the areas of concern. His 10.5 month results are shown below with a liberal amount of gel used to establish his preferred hair style. This is the four year update for the patient below after his second session with Dr. Hasson. He came into our Seattle office to visit with Doug and Mike and they shot the following video. He had two sessions for a total of 7729 grafts. This local patient had no single isolated area of loss but rather a diffused thinning of the hairline and down the middle of the scalp into the crown. This called for a general thickening with no particular point of concentration. 3525 grafts were placed in one session. This is a good representation of why shaving is critical when a substantial amount of native hair is still present. Had this patient not been shaved he stood a high chance of experiencing significant permanent shock loss due to recipient site transection. This is an interesting case. In March of 2008 this patient came into our office to have Dr. Hasson begin corrective procedures. Turns out, he went to India to visit family in 2007 and decided to investigate the local hair transplant opportunities. A local doctor told him about FUE and the patient decided to move forward with a procedure. When he returned to Vancouver and the results matured he decided to let Dr. Hasson review his case and make recommendations. The hairline that was placed previously was much too low and the previous doctor has attempted to close off the temples. The grafts were angled improperly and were much larger than they should have been leading to the extremely pluggy look you see in the photos. Dr. Hasson recommended graft removal in two sessions then to follow up with a proper hair transplant procedure to rebuild a new hairline as much from scratch as possible. A couple of notes about this case. First, it is obvious that the previous physician used a rather large punch on this patient, at least 1.2mm in our estimation. Second, it should be noted that repair cases cannot always be addressed in one session. This case shows that sometimes a multi-stage approach is the only way to properly address the needs of the patient but with the right amount of time and PATIENCE a cosmetically acceptable result can be achieved. There you go once again hason and wong,good job of posting result videos!! » There you go once again hason and wong,good job of posting result videos!! Thanks, Hairlove. It’s nice to know that our documentation is recognized and appreciated.